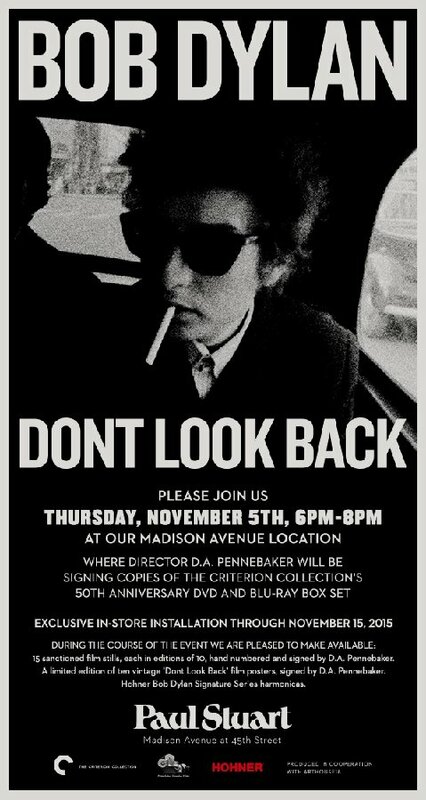 DA Pennebaker signing 50th anniversary edition of Don’t Look Back today from 6 to 8pm at Paul Stuart, Madison Avenue. The famous chronicle of Bob Dylan meeting fame, fortune, Donovan and Joan Baez turns 50 this month with a beautiful new edition from the Criterion Collection. Pennebaker will make a rare appearance later today, from 6 to 8pm, at the Paul Stuart store on Madison Avenue to sign the new box set. “Don’t Look Back” was shot on Dylan’s tour of the UK in 1965 and released to acclaim in 1967. It became a cult film and then a staple in every video library. Bob Dylan – Subterranean Homesick Blues – HQ from Noisefield on Vimeo. The Eagles Must Postpone Kennedy Center Honors: Glenn Frey Didn't "Take it Easy"